If you are looking for a criminal lawyer to represent you in court, you might be tempted to search for a cheap criminal lawyer and hire them based on their price alone. We are not suggesting that you need to spend ridiculous amounts of money to get good legal representation. In fact, at Harper Finch Lawyers we pride ourselves on the outstanding service we provide at an affordable price (often well below other law firms). Instead, we are suggesting that you consider exactly what you are after from your criminal lawyer and ask yourself whether a cheap lawyer will be able to give you what you want. Many lawyers unfortunately try to be jacks of all trades and masters of none. They will accept any work that comes their way, even if they do not have the knowledge or experience in that area of law to provide their clients with good outcomes. They have good intentions but they just don’t have the knowledge to deliver results. In those cases, they may try to reduce their legal fees as a way to take into account their reduced knowledge about criminal law. They might think that they are doing you a favour by offering cheap fees but what will it cost you in the long run? 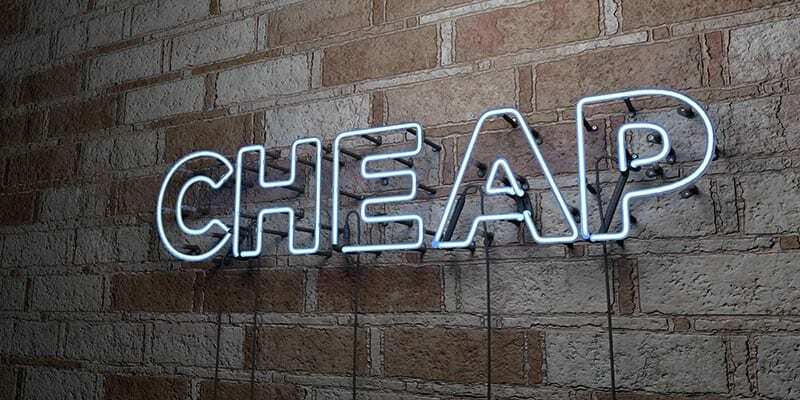 A lawyer might also be much cheaper than others simply because they don’t have the same level of experience as more senior lawyers, even if they only work in criminal law. Keep in mind also that a young lawyer does not always mean that they are inexperienced. Similarly, an older lawyer might have only been working as a lawyer for a few months. An experienced criminal lawyer is someone who has been working in criminal law for long enough that they have successfully dealt with a wide range of criminal offences such as yours. This allows them to know how to handle any type of situations that can arise. Just like a lawyer who does not have enough knowledge about criminal law, there are lawyers who will reduce their fees simply because they don’t have enough experience to justify charging more. Again, what might hiring that lawyer cost you in the long run? If a lawyer does not have enough work to do, they might offer you a ridiculously low fee simply because they are desperate for the work. A successful criminal lawyer however is a busy lawyer and therefore you need to ask yourself why that lawyer might not be as busy as other lawyers. It could be because they are unable to provide the level of service that most people expect from an experienced criminal lawyer. At Harper Finch Lawyers, we have purposefully structured our law firm to reduce overhead costs. We can then pass these savings on to you. We don’t bother with expensive radio jingles which you would end up paying for. We let our reputation speak for itself through word-of-mouth referrals and by providing valuable resources to the public. We don’t have expensive offices which cost an arm and a leg. Rather, we are set up so that we can work from anywhere we need to. Whether it’s in a courtroom, in a plane or in your lounge, we have access to all the material and information we need to run your case. However we still have conference rooms available for those times when we need to meet in person. We also don’t charge you for all the little things that other law firms do. We offer fixed fees in almost all cases and these quotes are all-inclusive. You want to call us? You need us to post you some documents? You need us to photocopy large bundles of documents? That’s all included in our fixed fee which results in considerable cost savings to you. In short, we have reduced our costs and expenses while increasing our ability to provide valuable legal services to our clients. If you want to experience the Harper Finch Lawyers advantage, contact us now for an obligation-free chat. Previous Previous post: Drink driving a horse? You bet!